Savifier is a rather old adware program that is slowly dying, but it can still be found in some places. At present, the chances of getting it are rather slim, but, if you do get it, then you should remove it immediately. Adware applications are never safe to begin with, but, at this point Savifier is even more likely to promote unreliable content, because its developers will probably do business with anyone who agrees to pay for their adverting services. Therefore, it is possible for your computer to become infected with adware, browser hijackers, and other malicious software. This application can also collect certain information about you. Apart from that, this program is incapable of providing anything useful to you, so you ought to get rid of it. However, we invite you to read this whole article as it will provide you with a more detailed review of Savifier. We say that this application is nearing its end because it used to have its own website at Savifier.com that featured a download button. It seems that its domain name has expired and the website is no longer accessible. It is possible that its developers will reestablish the website, but we do not think that this will happen anytime soon (if at all). Nevertheless, its developers also use an alternative distribution method called software bundling. 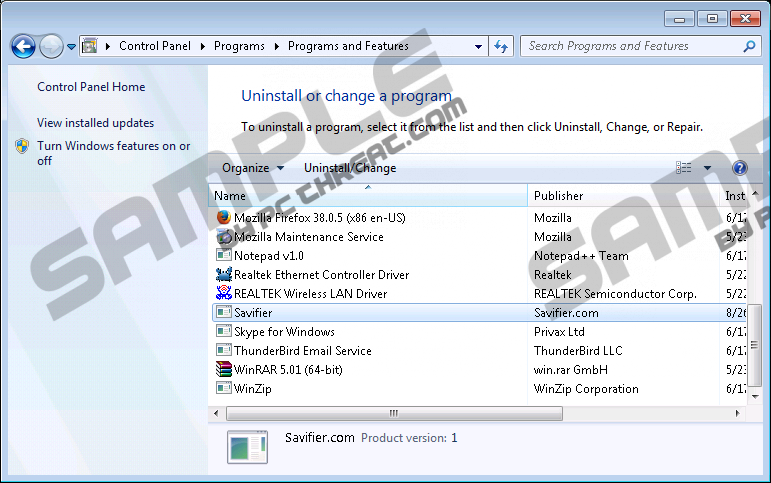 Basically, adware such as Savifier share installation wizards with one or more other programs. One application always represents the whole package, so you might not even notice additional software, as some installers are made to show it only after clicking the custom installation settings. So always opt for custom settings and uncheck undesirable software. Bundles containing Savifier can be found on borderline-legitimate software distributing websites. So, we have covered its deceptive distribution tactics; now let us see how it works. Savifier’s only purpose is to display third-party advertisements of questionable legitimacy. Its developers make money by providing advertising services, and they are apt to do business with anyone willing to pay for them. Therefore, this application might advertise malicious software and websites. This program’s ads may be displayed as coupons, pop-ups, banners, interstitial ads, search related ads, and so on. The ads are not very intrusive and they are not displayed on every website, but accidentally clicking them when they are shown might lead to undesirable consequences. However, that is not the only reason why you should delete this application. Our research has shown that Savifier can gather certain information about you. It is not the same as spyware, because it does not collect personally identifiable information. It automatically collects non-personally identifiable information that is needed to successfully implement targeted advertising. The information this program can obtain includes but is not limited to IP addresses, approximate geographical location, browsing history, search history, PC specifications, browser type, viewed ads, and so on. Even though this information cannot identify you as a person, you might feel reluctant to share it with unknown entities that aim to present you with tailored yet unreliable content. In summary, Savifier is quite an old adware application, yet it is still around and it displays third-party advertisements. The ads are somewhat annoying, but not very intrusive. However, they might promote unreliable software and other content that can compromise your computer’s security. In addition, this application can gather non-personal information about you and use it for advertising purposes. So would you like to keep this program? If not, then we recommend that you remove Savifier using our removal guide. Locate Savifier and Uninstall it. Right-click the Start screen button and select Control Panel. Find Savifier and click Uninstall. Locate Savifier and Remove it. Quick & tested solution for Savifier removal.